It is getting thick… To think that the media is splashing around the idea that markets moved higher on the latest jobs report is ridiculous. Then they tried to tell us that Fed Chief Yellen’s testimony was cause for markets surging.. Really? 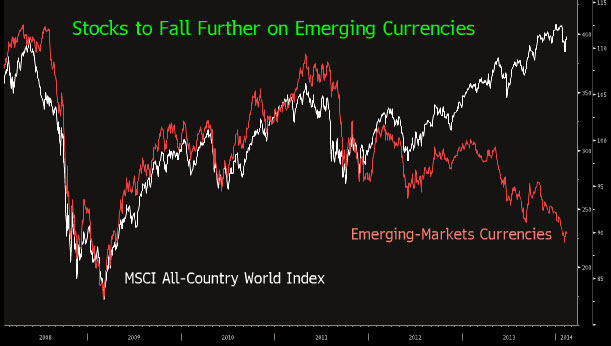 One of the charts discussed..
Declines in emerging-market currencies are a signal that stocks worldwide will extend this year‘s drop because cuts in Federal Reserve stimulus will curb growth, said Gautam Batra of Signia Wealth Ltd.
As the CHART shows, the MSCI All-Country World Index and a Bloomberg gauge of 20 emerging-market currencies moved in tandem from 1999 to 2012. The two measures then diverged and widened to a record on Jan. 22. Since then, equities have dropped 2 percent, more than the 0.3 percent decline for the currencies. Weakness in emerging-market currencies will hurt profit at global companies, which are increasingly dependent on those nations, according to Batra, managing director and investment strategist at Signia in London. Almost 53 percent of U.S. trade came from developing countries in 2012, up from 39 percent in 2002, data compiled by Bloomberg show. For the European Union, the proportion rose to 28 percent from 18 percent. The gauge of emerging-markets currencies fell 3 percent last month, extending last year‘s 7.1 percent decline. That helped send worldwide shares down 4.1 percent in January as the Fed‘s decision to press on with bond-buying reductions spurred concern the economic expansion may falter. Equities jumped 20 percent in 2013, their biggest annual gain since 2009.